My sixth annual Girls Night In was actually an afternoon in this year. The idea is to stay in and donate the money you would have spent on a night out towards the fight against women’s cancers. It’s a cause close to my heart and I’m lucky to have family and friends so willing to contribute. And, of course, it’s a good excuse to get together and have fun! In the past, we’ve had dinner and played a game like Taboo or poker. 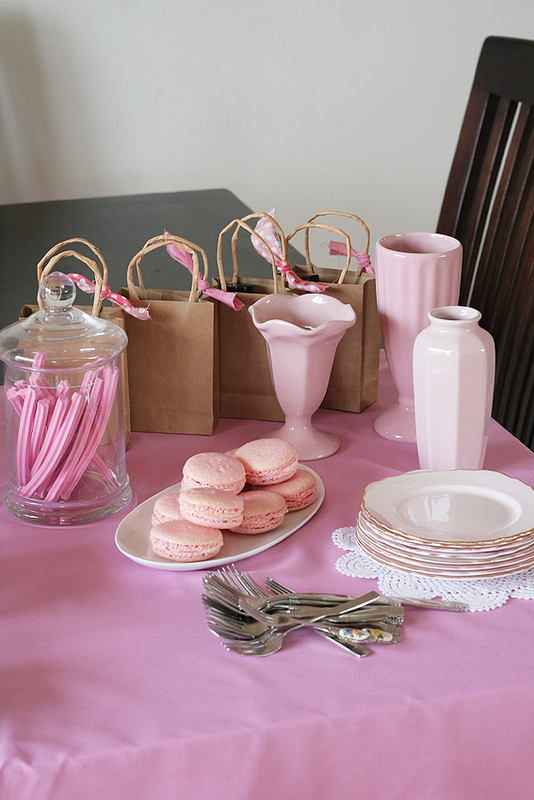 This year, it was an afternoon of pink treats baked by me and shared between the eight of us. 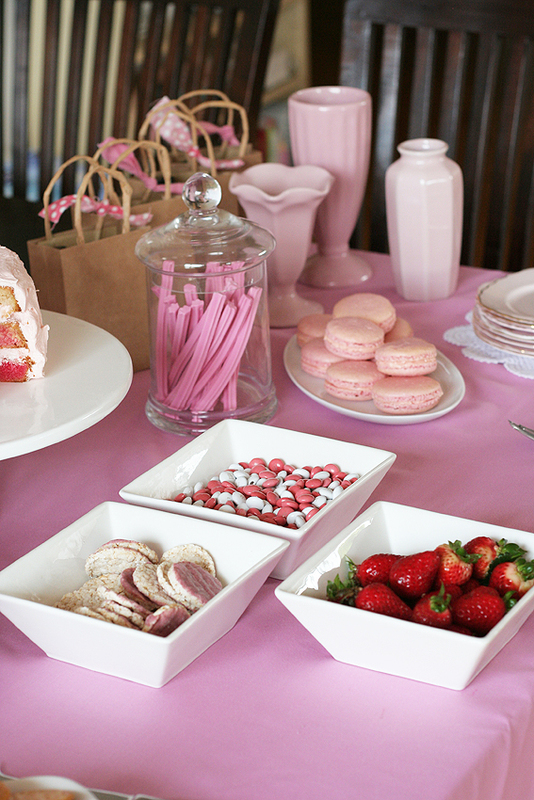 Two of my guests are gluten-intolerant so I provided a selection of gluten-free treats as part of the spread. My aim with any gluten-free baking is to make something that everyone can enjoy, rather than a poor alternative to desserts with gluten. Sometimes I modify a recipe I have and other times I bake a treat that does not require flour of any kind. It’s easy to modify many recipes by using gluten-free flour mix instead of wheat flour. I’ve had good results with most recipes, especially the Hawaiian carrot cake I made back in July. 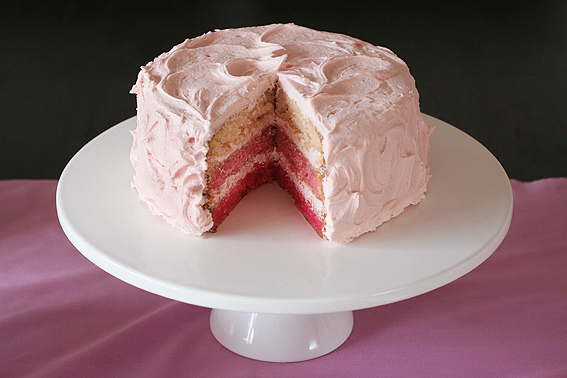 This pink cake is from the same recipe I used for the rainbow cake in June; however, this time I used gluten-free flour mix and made three layers instead of six. Each layer baked for about 30 minutes. I had no real issues with the gluten-free flour; the taste and texture of the cake were comparable to one with gluten. 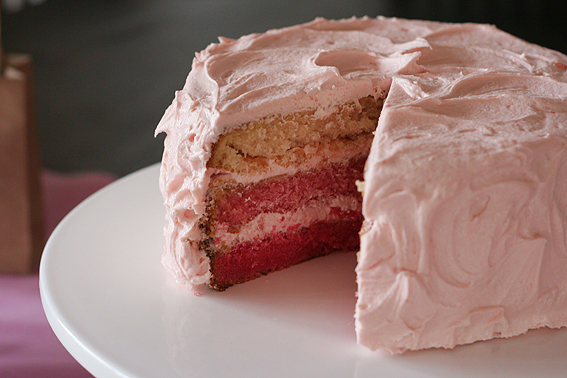 To assemble the cake, I made a big batch of pink-tinted buttercream frosting. The cake held together well when sliced; popping it in the fridge for just a short while can help the frosting “set” and make it easier to cut. 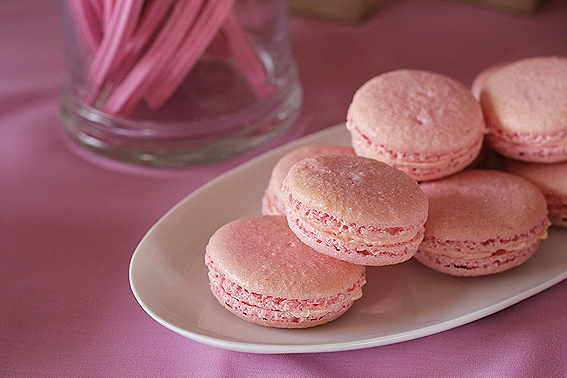 The other gluten-free treat I baked was pink macarons. Most macaron recipes are gluten-free, as they call for almond meal, icing/confectioner’s sugar and egg whites, so I didn’t have to modify the recipe at all to make it gluten-free friendly. (Check your sugar is gluten-free, as the manufacturer may have blended it with something other than corn or tapioca starch.) I tried unsuccessfully to make macarons once before but I’m pleased to say this time went smoothly. Some leftover swiss meringue buttercream between the biscuits was the finishing touch. These were the most popular sweets on the table, I should have made twice as many to keep up with the demand! The recipe for the chocolate cupcakes was the German chocolate cake recipe from the Baked Explorations cookbook. I used milk chocolate instead of dark and baked 36 cupcakes for about 25 minutes. This is definitely my favourite chocolate cake recipe to date, so expect to see it some more in Katie’s Kitchen. The frosting is swiss meringue buttercream piped on with an open-star tip. Remember to serve the buttercream at room temperature. 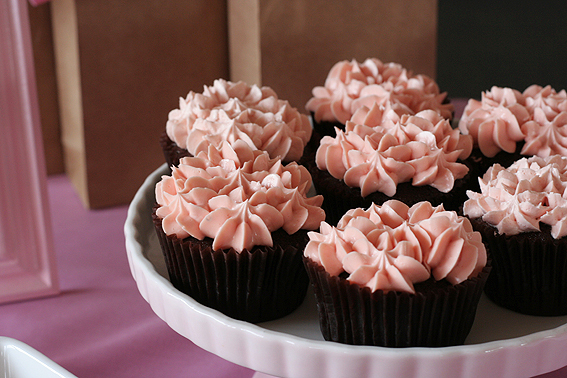 Sweetapolita has some great tips to help you make this light and fluffy frosting. At the supermarket, I also picked up some tasty berry yoghurt coated rice cakes, as they are gluten-free and most importantly pink. Fresh strawberries, musk sticks, cheese, dip and crackers rounded out the afternoon’s snacks. Each guest went home with a goody bag of chocolates and a mini bottle of body lotion or body wash in sugary-sweet scents. 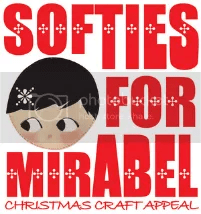 As a result of the afternoon, the Cancer Council will receive a nice-sized donation from my family and me. Thank you to my grandmother, aunties and cousins for their generosity again this year. What a beautiful party! You’ve done a fantastic job Katie! Katie, You certainly know what you’re doing. The presentation is delightful and that cake glorious. Your tradition is inspiring. This is a great looking Girls Night In!! Love it! Nice post! I’ve looked at the rest of your blog, and its “delicious”!